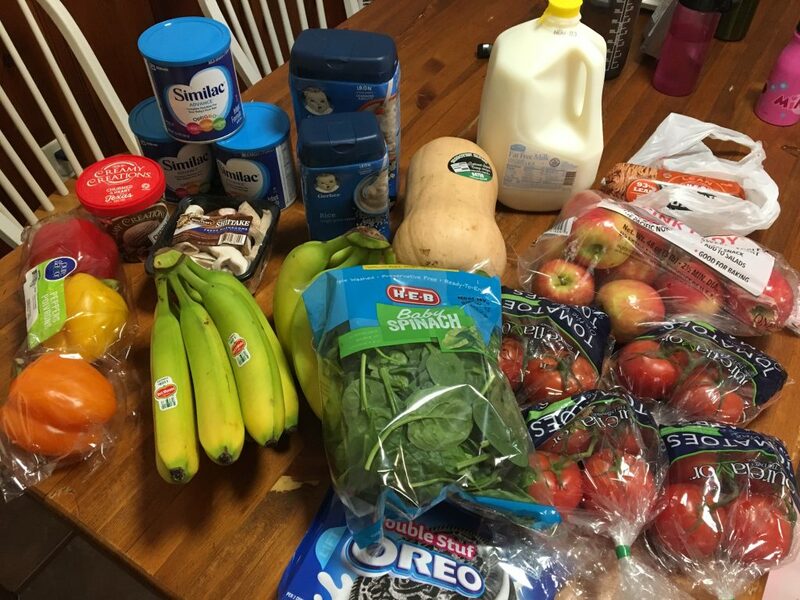 October grocery shopping was about two things: convenient snacks and easy meals. I ended up working a ton, Jesse had a 4-day trip to a conference, and we were just overall busy. I think maybe that’s just the season of life that we are in. 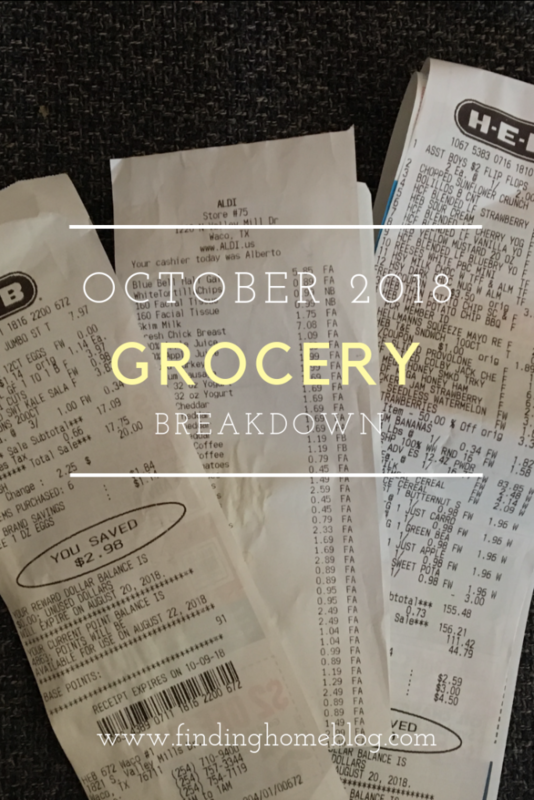 Here’s what our grocery shopping and menu planning looked like for October. First shopping trip of the month! 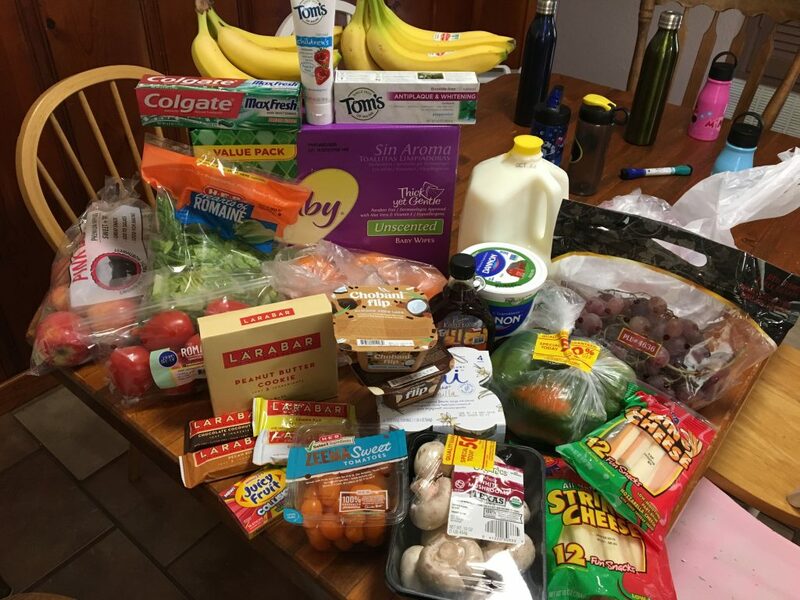 I don’t generally like to go to the stores on the first of the month, because they tend to be busier, but we needed groceries and it was grocery shopping day. Luckily, we went early enough that it wasn’t too bad. Finishing shopping for the beginning of the month, plus picking up the baby formula since we’re almost out. 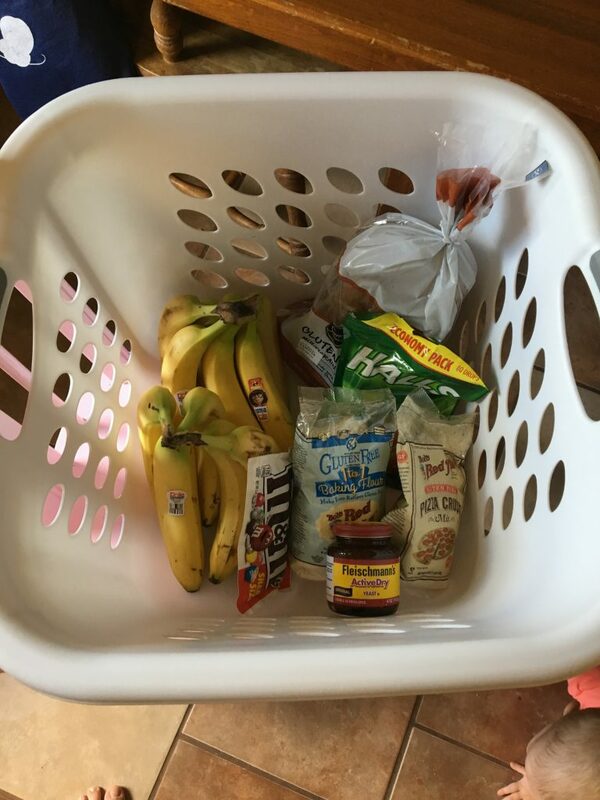 Fill in grocery trip for produce, snacks, and a few household things. Green peppers x3 $1.74 – these had a 50% off sticker on them, but that didn’t get taken off at the register. They were only $0.58 each, so still a good price. We were at Walmart to pick up the kids’ new glasses, so I grabbed a few things that we were out of. And then I grabbed another laundry basket (I left one behind in the move and I miss having two), but accidentally got one without a price tag sticker, and it took like 15 minutes at checkout. Not great, Walmart, not great. 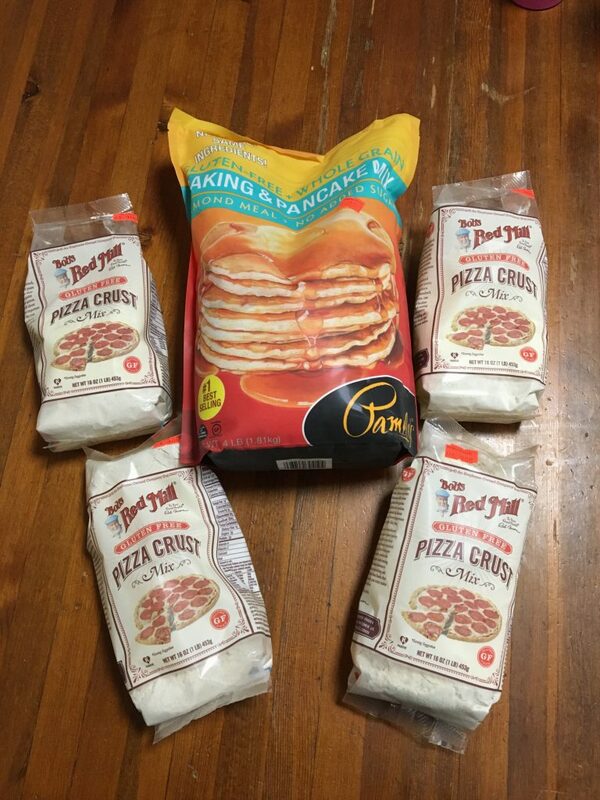 I was talking with a gluten free customer at Dunkin Donuts the other day, and he mentioned that this store had like 2 aisles full of gluten free stuff. Since we were in that part of town, we stopped to see. 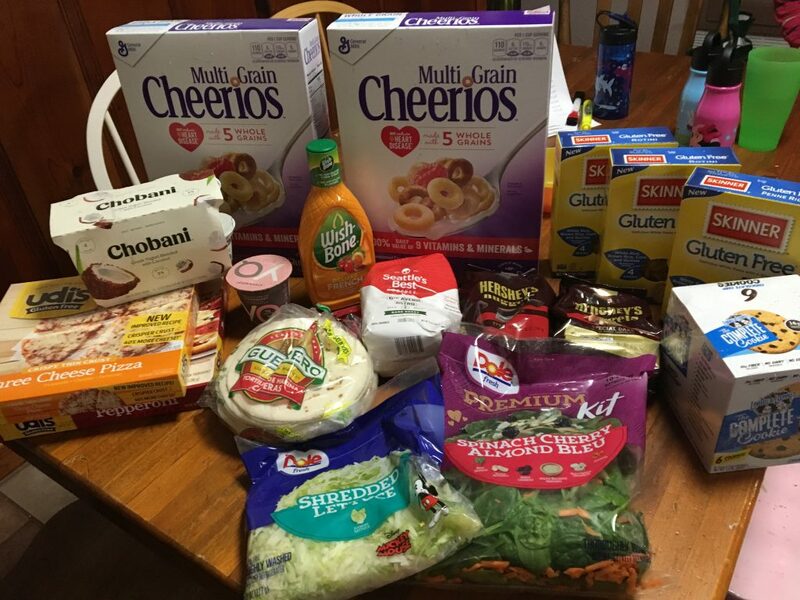 He was right – tons of gluten free stuff! I just picked up two of my favorite things, and guess what? My favorite pizza crust again! I use the Pamela’s mix for these biscuits – I just substitute 1 to 1 for the flour. And I also really love this yellow cake recipe from the Pamela’s website. It actually turns out fairly close to a flour cake recipe in terms of look and texture, and it tastes good too. We started our big shopping for the second half of the month. And it was pouring buckets of rain by the time we were done. I had to pull up to the door to load the kids and the groceries, and then I unloaded the groceries to the front door at home while the kids moved them to the kitchen. I was pretty bedraggled when I was done! We decided to put off the rest of our errands for another day. It was still raining later in the afternoon, but Jesse sent me to the store by myself, which is much easier to handle than rain with 5 kids. I finished up the shopping from the morning. This was my “Jesse is leaving for 4 days and I want snacks” grocery shopping trip. 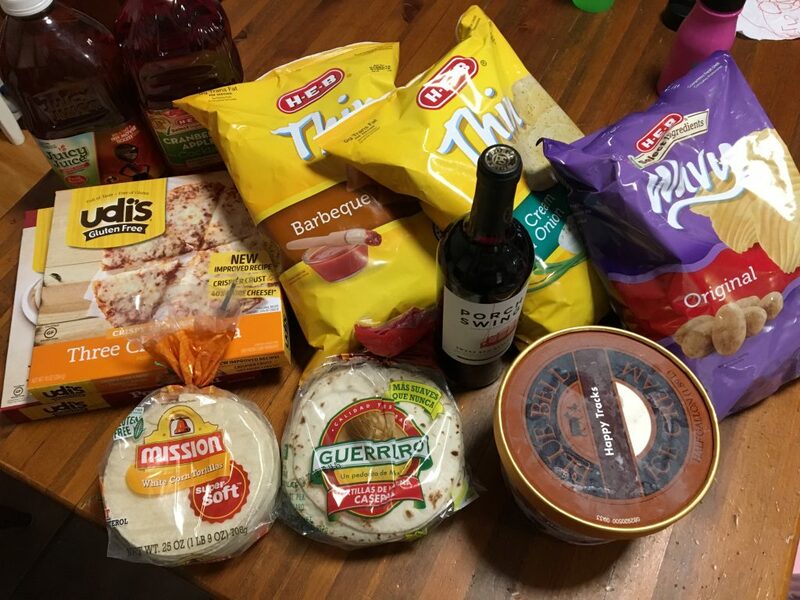 Plus we needed tortillas. Pizza night! Jesse decided to try to make a potato pizza like the Toppers Pizza one used to be (before they changed it to tater tots) and needed a couple extra ingredients. If you have no idea what I’m talking about, know that it’s a pizza with baked potatoes, bacon, green onions, and lots of cheese on it, and it’s delicious. Ours turned out pretty amazing too. This was really random grocery shopping. I left my list on the counter at home, but managed to remember everything except for chocolate. Produce for this week, a few items to make soups for the freezer for Jesse’s lunches, and a few things to make recipes from a Pokemon cookbook Jonah found at the library. Plus baby foods. Whew! That’s a lot of shopping for one month. Here’s how we did.